Welcome to ekovana! We pioneered the launch of stackable pans to further enhance your pressure cooking experience. Impress your guests, your friends and all your loved ones by cooking delicious one pot meals with this versatile pressure cooking accessory ! 4.One instruction leaflet providing general tips and pot-in-pot recipe ideas. Enjoy easy home cooking of healthy steamed dishes and deliver one pot meal for the entire family, be it breakfast, lunch or dinner ! Reheat food in your pressure cooker and completely eliminate the need for a microwave. Make two cheesecakes or lasagnas at the same time ! Store cooked and leftover food in the refrigerator. 1. You may choose to use either a single insert pan or both inserts, depending on your cooking needs. 2. Ensure that you add at least 1 cup of water to the main pot or liner and the individual ekovana inserts while cooking solid foods. If the recipe calls for liquid food, like sauce or curry, then you may only need to add water in the main cooking pot. 3. Food on the bottom stack will cook faster than food on the top stack. Please ensure that you have delicate food (needing less time to cook) placed in the top pan and dense food (needing more time to cook) placed in the bottom pan. For example: Pasta or noodles on the top and protein such as chicken on the bottom. VERSATILE - 2 tier stackable pans allowing for variety of foods to be cooked simultaneously. Great for steaming vegetables, meat or fish. Doubles as a dessert pan to make cheesecakes or use as a lasagna pan. Useful for pot-in-pot cooking. Perfect for reheating food without sacrificing taste and texture, also use as container for storing food. Patent pending. HEALTHY & CONVENIENT - Skip the microwave ovens and reheat leftover food or curry in your cooker to preserve the nutrients and vitamins. Reheat two dishes together, cook one pot meals and save time! DURABLE - Premium quality insert pans made from food-grade stainless steel. Secure-fitting stainless-steel lid traps in heat and moisture. Solid handle allows for safe and easy insertion and removal. Dishwasher safe for no-hassle cleanup. 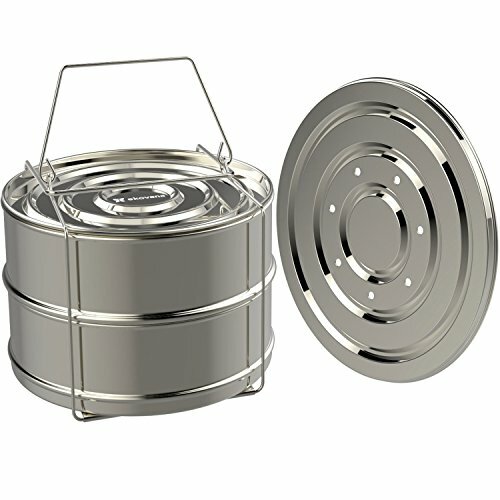 FITS 5, 6 & 8 QUART COOKER - This stainless steel cooker insert is a must have accessory for instant pot models IP-DUO50, IP-DUO60, IP-LUX60, IP-DUO80. Also fits other multi quart(6 quart and above) electric pressure cookers such as Kuhn Rikon, Power XL, Cuisinart, Fagor, Costaway, Faberware, T-fal, Elite, GoWise, Secura, Gourmia. 100% MONEY BACK | SATISFACTION GUARANTEE: It's a RISK FREE buy. We love our customers and are obsessed with your satisfaction! If you are not happy with the product for any reason, feel free to contact us for a full refund. If you have any questions about this product by ekovana, contact us by completing and submitting the form below. If you are looking for a specif part number, please include it with your message.